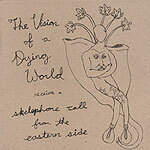 CD review: "Receives a Skelephone Call from the Eastern Side"
This review first appeared in the February 7, 2008 issue of the North County Times. On their fifth CD, an EP whose title is longer than the six songs it contains, local indie rockers The Vision of a Dying World shows a deft touch at blending alt rock edginess with velveteen melodies. The opening track, "Darkness," flies in the face of the rest of record, though, as it's a bit of overdramatic power-pop, with a satiny sheen to it. Nicely done, though. Starting with "Held the Hand" the band gets into its groove of face-paced, three-minute punk-laced pop nuggets. Driving rhythms, slashing guitars, urgent vocals  they sustain that manic energy for the last five tracks. It's the kind of music that would have resided quite comfortably on vinyl 45s, with enough punk swagger to take the edge off the sweet melodic hooks.